After a long day of repetitive pipetting, you are anxious to have your experiment results. However, stacks of microplates are still waiting for your pipetting and your thumb begins to ache. How long are you going to endure this kind of situation? It's time for you to say goodbye to manual pipetting forever. All you need is our reliable, affordable electronic pipette: A-pette from Arise Biotech devotes you more accurate and precise data, more time-savings, more protocols, more productivity and less effort! The biggest difference between traditional manual pipettes and A-pette electronic pipettes is the method they use to create a vacuum space to retract or propel liquid. 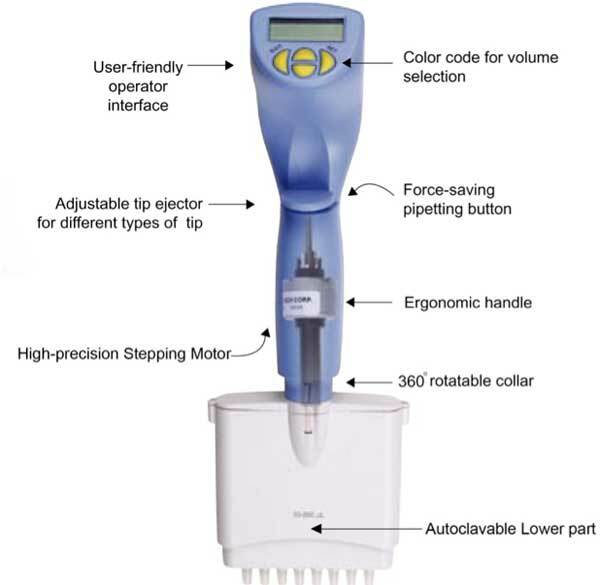 Traditional manual pipettes use medal springs, while A-pette electronic pipettes use high-precision stepping motors and microprocessors to control the pipetting volume and speed.